Pick you up from your cruise terminal by your private English-speaking guide, drive to Suzhou, one of the oldest Chinese towns established around 600 BC in the Yangtze basin. In Suzhou, we will first visit the Master of the Nets Garden, an exquisite example of south China classic gardens. 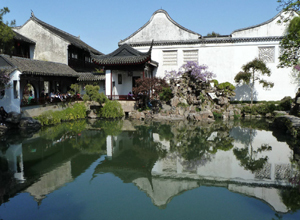 Next, head to the town’s ancient city wall and view Suzhou’s Grand Canal. After lunch, drive to the water village of Zhouzhuang. You will take a cruise by a Chiense-style boat along the charming waterways to appreciate the carved-brick archways and traditional courtyards of the buildings still in use since the Ming and Qing dynasties, as well observe life along the waterways where residents do shopping from boat vendors and wash their clothes. Be transferred back to your cruise port in Shanghai.